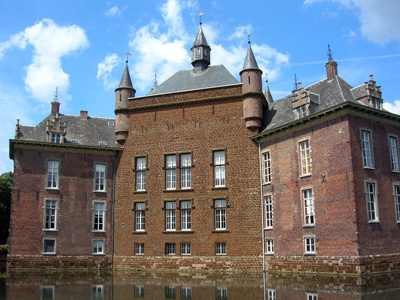 The castle of the Princes of Merode in Westerlo is a resplendent example of early Flemish Renaissance style from the Kampen region. Originating from the village of Merode, between Aachen and Cologne, the family of Merode obtained the seigneury of Westerlo by marriage in the 15th century. Through a series of other advantageous alliances, the Merode became one of the most powerful families of the Duchy of Brabant. The castle is said to have been built on the ruins of an old Roman watchtower, or possibly a Frankish villa. In the late Middle Ages, it dominated the region of Diest and Aarschot, thanks to its strategic location on a small river. In 1583, Westerlo served as a stronghold for the Beggars, a confederacy of nobles and other malcontents, who opposed Spanish rule in the Netherlands. Because of this, the castle was besieged by the Spanish troops of Alexander Farnese, Duke of Parma, who eventually took the castle after drying up the moats. The present castle was constructed in the middle of the 16th century, and originally formed a square. The western and southern wings have now disappeared, the latter being replaced by a new gate. The stone dungeon probably dates from the 14th century, but was partly rebuilt in the 16th century. Its walls are 2.5 m deep. Only a small part of the castle is open to the public. The Gothic and Renaissance interior startles the visitor by its dimensions. The ceiling in the dungeon reaches 10 metres in height, and the fireplaces are enormous. The various rooms are filled with great portraits (including those of Emperess Maria-Theresa and Emperor Francis I), grandiose Renaissance tapestries, porcelains, as well as original furnishings from the 16th to 19th centuries (note the old bathrooms). The castle is only open one weekend per year, for the local fair, usually held in the first week of July. Check the official website for the exact dates. Admission is 5 € and includes access to the most impressive rooms of the castle, the park, and the fair, where you can watch birds of prey or buy arts by local craftsmen and artists. 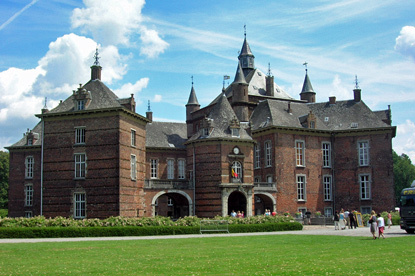 The castle is just outside the village of Westerlo, on the N19 road between Aarschot and Geel. Coming from Antwerp or Liege take the E313 towards Hasselt until exit 23 for Westerlo. From Brussels, take the E40 towards Liege, and at Leuven change for the E314 towards Hasselt. Take exit 22 for Aarschot, then follow the N19 on 7km.